Altered Books - Adding or Subtracting Value? When I was teaching myself how to write, now many years ago, I wrote a short story called "Nocturne in Blue." Typically, nocturnes are musical compositions, often written for piano, which evoke pensive images, especially of moonlit evenings. A popular example is Claude Debussy's "Clair de Lune." Nocturnes don't always take the form of music, however. James McNeill Whistler painted nocturnes, assiduously scraping his canvases after the paint had dried to reveal tiny pin-sized points of white. The effect was to cast a glow over the entire composition, not unlike the reflected light of a moon. 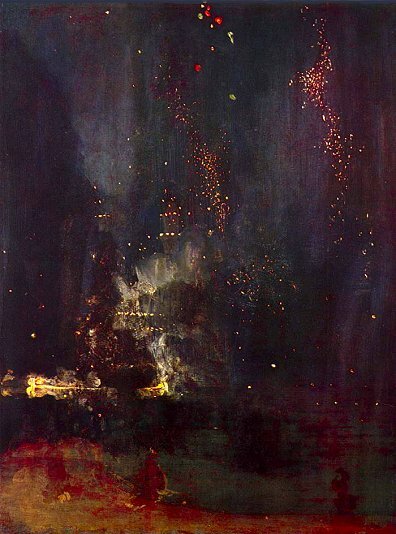 "Nocturne in Black and Gold: The Falling Rocket," a personal favorite, appears below. If you haven't had the privilege of seeing one of these paintings in person, well, take my word for it; they are stunning. Nocturnes may also be written. Usually this takes the form of a poem. After chipping off the dried glue from the edges, I punched three holes in every last page, pasted gummed reinforcements on each hole, and put them in a small loose-leaf binder. This was the basis of the book. Then I began to add stuff, hundreds of things - color cards from paint dealers (especially dark hues, nocturnal colors), a tiny art gallery, which included miniature reproductions of Whistler's nocturnes, photographs of moons, moon maps, a glossary of celestial terms, sheet music of nocturnes, literary fragments, notes, even glassine interleaves to protect every page. In short, I put together a highly specialized dictionary, my dictionary, my tool, a precision instrument for composing nocturnes, now and forever un-gettable anywhere. It occurs to me that most of us would be intrigued by such books, especially those which significantly enhance existing content. I actually own - have made - several of these things, but nothing as elaborate as the one in my story. 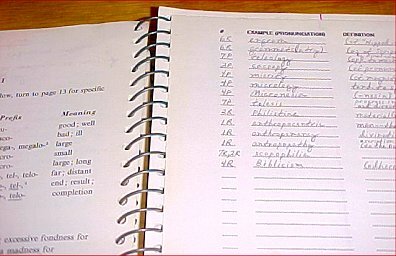 The page shown in the following photograph is from a book titled Word Clues, a vocabulary building guide based on the memorization of Greek and Latin roots which commonly appear in English words. The roots, in turn, serve as clues to the meanings of the words they appear in. It's a powerful method because knowing the meaning of one root can sometimes enable you to puzzle out the meanings of 100's of otherwise difficult English words. Anyway, it's hard to find this book in any state, but in the enhanced state mine is in, it's unique. On a good day, it would probably sell for more than an unaltered copy. 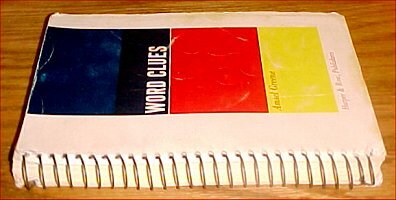 There are a number of blank pages present in Word Clues (or there were when I bought it), each one facing a page with a list of lesson roots. The purpose of the blank pages is to provide space for adding additional examples of English words which contain the corresponding roots - in other words, this book was designed to be added to. As you can see from the photograph, I not only took advantage of this but also used tipped-in sheets with printed headings and blank lines to maximize what I could add. Even today, the book is a useful, irreplaceable reference for me. Also, apart from its reference value, it's become one of my favorite books, despite an almost pathetic appearance. In one sense I think you could call this (and the book in my story) an altered book. If the alterations to such books are significant, significant value can be added, though of course, if they take the form of something like yellow highlighting, dog-eared pages, and similar mnemonic devices, value can be all but destroyed. Sometimes books are altered by what is called marginalia - a reader's notations, sketches, etc., made in the margins of the pages - and if the reader is either important or otherwise famous (or infamous), great value can be added. William Blake, the 18th century English poet and engraver, was an especially enthusiastic marginalia-ist. It's a good thing. He annotated many works of philosophy in his library, and his margin comments/thoughts about Berkeley, Locke, et al, give us valuable insight into the poetry he wrote later in life, an often inscrutable body of work called the prophecies. In recent years the term altered book has gained wide currency, but oddly enough, not in the book trade. Specifically the term refers to books that have been subjected to - well, perhaps the best word for this is assault. The craft of altering books has exploded on the heels of a previously exploding craft - scrapbooking - from which many of its techniques have been borrowed. Classes on altering books are taught, groups have formed (one Yahoo group in particular currently boasts thousands of members), and home parties are being scheduled across the country as we speak. The essence of the craft is this: books become a sort of un-blank canvas upon which things may be added, subtracted, painted or otherwise obscured, written, artificially aged, burned, stamped, pierced, collaged, and so on. The purpose of this activity, at least as it's most often stated by practitioners, is self-expression, with perhaps the further intention that this expression will enhance the experience of encountering the book, sometimes by way of expanding or deepening its themes. In reality, however, most of it comes off as good fun, not a profound literary experience, and of course the familiar saw applies: "There is no such thing as a mistake." In the past several weeks I've examined many examples of this craft (see the list of links below; open new browser window). Though many of the books which have been subjected to this smorgasbord of mixed media more often than not come up short of possessing what I'd call enhanced value, there are a good many exceptions. Some altered books do indeed rise to the level of what may be called art, but even in this sense I think a distinction needs to be made between altered books and artists' books (which have a more or less established history and significantly more credibility). The latter books are mostly or entirely made from scratch, usually by accomplished artists; whereas the former are existing books which have been changed. Depending on the extent of the alterations in altered books, the line between the two types can and does become blurred. Some examples in the links below contain what might be more accurately described as artists' books. What, if anything, do altered books mean to the bookseller? Unfortunately, not a great deal, but there is at least some potential here. Though many books are purchased for use in altering, usually they are had for pennies or nothing at all. If there are exceptions, it's vintage books, especially those with decorative elements. Since much vintage fiction is so often without value, these make good candidates for sale as project books. Cosmetic condition is not overly important - in fact, discolored boards, torn cloth, etc., can produce a sought-after aged quality. However, integrity of the binding is important since the book will suffer a considerable amount of handling in the altering process. Popular fiction titles, the classics, etc., will probably attract more interest than obscure titles, and the presence of a color pictorial front board is a big plus. When choosing books, look particularly for Victorian, Art Nouveau, Arts & Crafts, and Art Deco elements. Consider grouping your vintage books in lots of 5 or 10 or so, and you may realize several dollars apiece for them. Sometimes more. Also, be sure to present them as altered book projects and list them in an appropriate category - for example, paper crafts. Supplies for altering may also be profitable, and if you have a number of vintage, illustrated books that no longer function well as books (e.g., if they are disbound, heavily foxed, etc. ), some value may still be derived from them. A grouping of carefully chosen ephemera consisting of illustrations and photographs removed from books, also brochures, envelopes, letters, etc., might attract a good price, especially if deliberately presented as altered book ephemera for collage, and most especially if the lot contains a high percentage of vintage material. 100 to 300 piece lots may attract bids in the $30 to $50 range. Altered books - the actual finished products - are sometimes sold, but some measure of artistic achievement (or other telling factors, such as celebrity provenance or unusually distinctive content) will need to be present to get much for them. More often than not they're given as gifts or simply passed around for others to see. Round robins - passing a book around for a group of book "alterers" to work on - are popular as well. But who knows, maybe a hundred or so years from now altered books, no matter what their initial quality, may command prices similar to what Victorian diaries do today.